Apart from day outings with friends and neighbours in the new year and a short proving trip earlier in May, this cruise represented the start of the 2017 cruising season proper and the intention was to proceed straight to sea and join other Broom owners for trips down the East Coast, but our first overnight stop without shore-power at Acle revealed that we needed new domestic batteries for Lady Martina and so a visit to see Kevin Peachment in Brundall was a priority. The Plan - I had spent some time registering my new paper navigational charts and copying my waypoints from old ones on to the new ones. This was because I had been in contact with the Yarmouth Yacht station rangers and compered notes on the best times to approach the bridges the next day and agreed that it would be towards lunchtime. 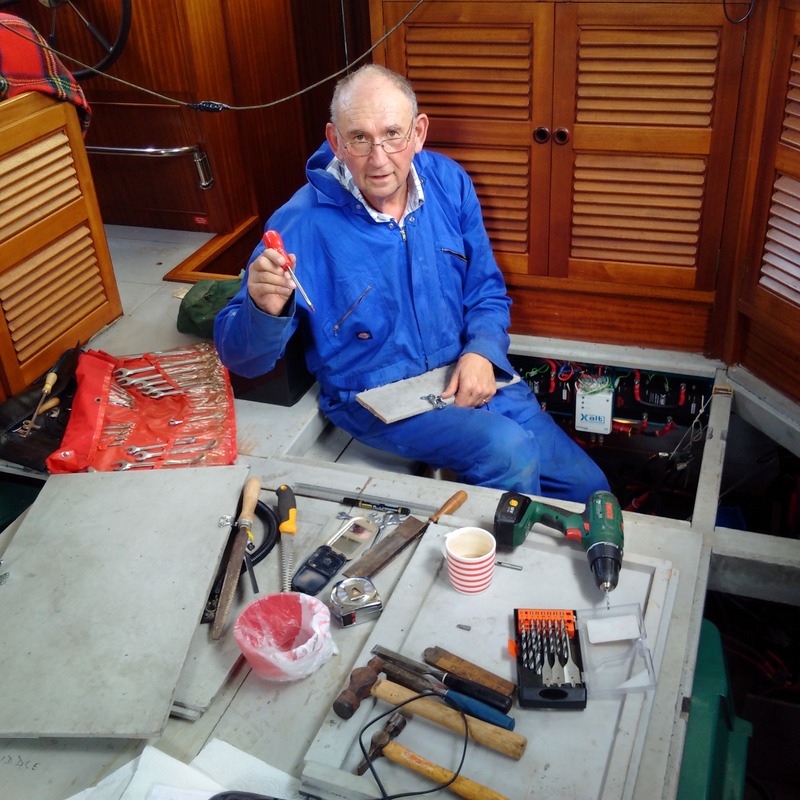 I had also arranged a mooring at Oulton Broad yacht station for an overnight berth on Wednesday evening and Mutford lock transit on Thursday afternoon and then a stay at Lowestoft Haven Marina on Thursday night ready for an early exit on Friday morning. Normally, I would have stayed at the RNSYC moorings in the outer harbour but they were all committed with a large fleet of Dutch boats arriving for their Ascension Day weekend holidays and so we could not stop there. 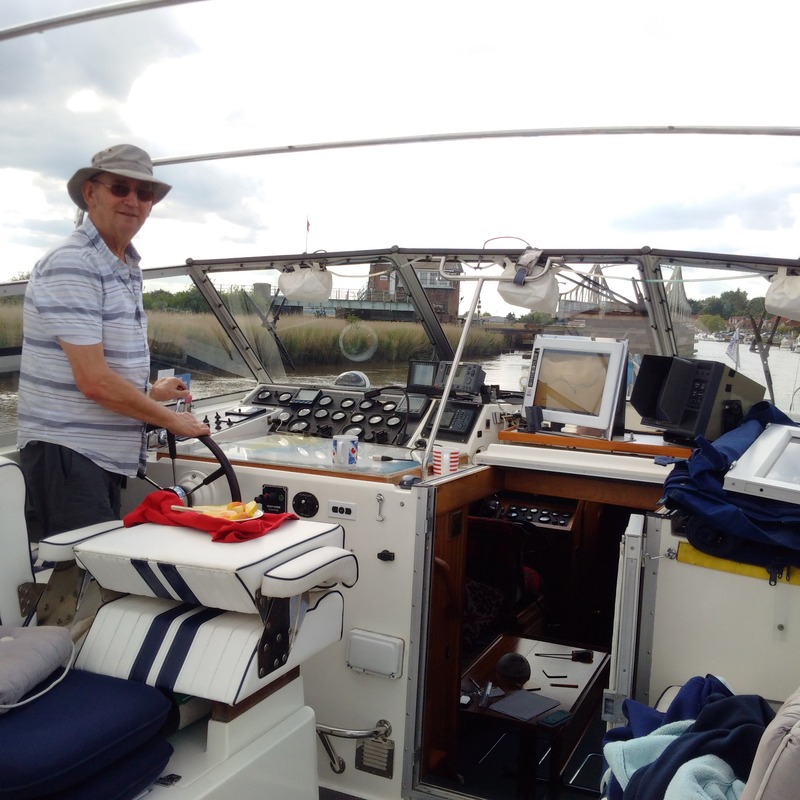 We set off and forwent many other mooring opportunities to cruise down the Bure, past Thurne Mouth and on to Acle, where we found a mooring well away from the bridge and traffic noise. My plan was to stay overnight and then take the canopy and mast down to get under the bridge and then keep them down for the trip through the Yarmouth Bure bridges later on. Once we stopped, I soon found that my domestic batteries were struggling and not able to keep a charge, even though we had been cruising from hours after starting with a shore power service overnight! We struggled through the evening and overnight with candles lighting our way, enjoyed showers from the plentiful hot water and then had an early night, pledged to research alternative battery strategies in the morning. The Preparation - Kevin Peachment came up with two higher-capacity battery options, one of which at 220AH was just too wide for our battery bays but the other, rated at 200AH, was reasonable narrow but just a little too long. I worked out that by just extending one 40cm edge of the battery compartment by less than a centimetre, I could just accommodate a 200AH version which, with four installed in serial and parallel, would give us a theoretical 400AH at 24volts. Kevin got these on order for me and kindly offered me the opportunity to moor up at his riverside chalet opposite his works for the night and to perform the battery swap the next day. That left the slight matter of navigating down the River Bure to Great Yarmouth getting under the Bure Bridges and then making my way up the Yare through Reedham Bridge. At this point I engaged the help of the Broads Authority rangers at Great Yarmouth Marina and kept checking on the bridge heights as the morning progressed. We arrived there around 1pm and unfortunately the river had not dropped enough and so we moored up for an hour or so and then left when the tide marker was reading about 10ft 3ins. We got under the bridges with more than 4ins to spare which means that anything over 10ft would be good for future reference. It was a lovely calm, warm and bright day with sunny spells and easy to moor at the Yacht Station and then put up or windscreens and radar mast whilst we cruised on autopilot across Breydon Water. I opened up the engines and made more than 20knots through the water (17 over the ground with an adverse tide) with near-maximum revs and some vibrations. This confirmed my preference for cruising at a slower and more economical speed. We were able to arrive at Kevin’s chalet and he kindly opened a cupboard so that we could use the shore-power overnight and during the installation the next day. We spend a very pleasant evening in the sun with virtually no wind and even managed to use the Broom Boats Wi-Fi once Kathleen had walked to their yard and secured the code. It was a good reception by very slow service, which was just fine for us. The Successful Outcome- The problem was always going to be that the new higher power replacement batteries were marginally larger than those they were replacing and so I had to cut and extend the battery compartment by a centimeter or so. I really needed to know exactly what shape the new batteries were going to be but I took everything apart and removed the first two of the old batteries and was ready to start the modifications. I made the second of two visits to the Peachment offices and this time I managed to secure a spec sheet which showed exactly what dimensions and shape the news ones took and so I could cut out the right section. I was then fabricating the extension when the delivery took place an hour earlier than expected and I had to finish the job quickly but, with the help of two Peachment guys lifting the new batteries on to the boat and lifting off the old ones, and me positioning them, the physical swap was completed and they all fitted in nicely. 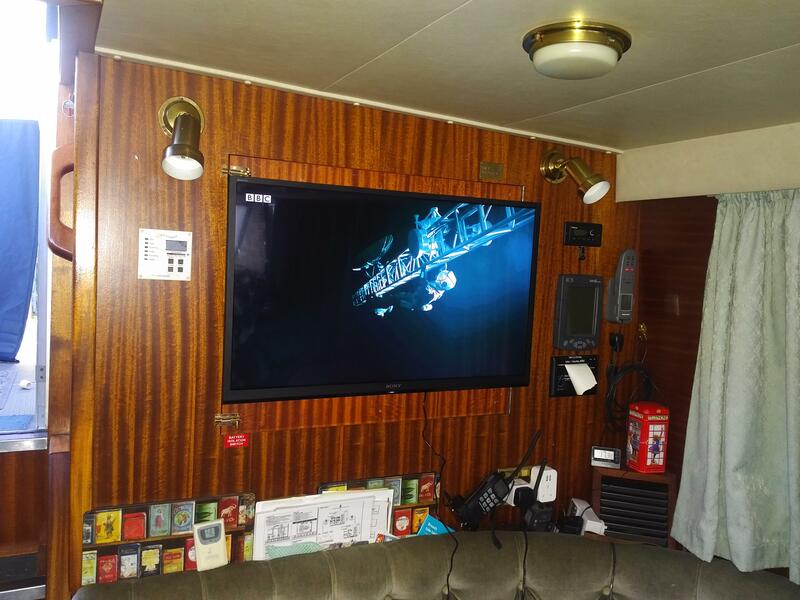 We then got Lady Martina roughly straight and cast off and cruised to Broom’s marina where we took on board around 150 litres of diesel to top up our tanks and bought filter cartridges for our new primary fuel filters and we were now ready to go!